Should Collectors Change the Validation Notices Sent into Pennsylvania? Collectors frequently point to contradictory language among the FDCPA and other statutes as proof that standardized debt collection rules are needed in this industry. However, even in an industry where consumer attorneys frequently make "creative" arguments, it is rare to see a claim that the FDCPA itself contains contradictory language. In a number of recent cases, consumer attorneys are arguing that the validation language from the statute – the same language collectors have been using since the FDCPA was enacted in 1977 -- is now somehow unclear and confusing. Specifically, consumer attorneys argue that the first sentence of the validation notice (relating to disputes), which does not contain an "in writing" requirement, contradicts the second sentence of the notice, which does require a written request from the consumer to receive verification. Unfortunately, two Courts in New Jersey within the past year sided with the consumers in denying debt collectors' motions to dismiss on this issue. Two more cases on the issue – on which the debt collectors prevailed – are pending before the Third Circuit Court of Appeals. New Consumer Strategy for Baiting FDCPA Violations And Use of Text Messages in Debt Collection. COLLECTORS FINALLY WINNING FDCPA CASES: HAS THE TIDE TURNED OR IS SOMETHING LURKING? Consumer attorneys subjected debt collectors to a barrage of FDCPA lawsuits, especially in New York and New Jersey, on collection letters in 2017. This trend will continue, and likely accelerate, in 2018. Debt collectors hoping for relief from the Courts on the latest consumer attorney claims regarding collection letters may get some clarity in the near future. The Second Circuit Court of Appeals recently considered oral arguments on the issue of whether a debt collector must disclose when interest is not accruing on an account in the Taylor case. A decision is expected in the Taylor case within the next year. Also, a recent decision from New Jersey held that validation language in a collection letter that tracks verbatim the wording of the FDCPA somehow violates the FDCPA. An appeal to the Third Circuit Court of Appeals in that case is expected. In addition, the Third Circuit Court of Appeals recently issued an opinion on whether use of the word "settlement" in a collection letter violates the FDCPA. In the latest episode of the Debt Collection Drill podcast, Moss & Barnett attorneys John Rossman http://www.lawmoss.com/john-rossman/ and Mike Poncin http://www.lawmoss.com/michael-s-poncin/ discuss these recent cases affecting debt collection letters and specific strategies that agencies can implement today. Regulation E may be satisfied if a consumer authorizes preauthorized EFTs by entering a code into their telephone keypad, or, Supervision concluded, the company records and retains the consumer’s oral authorization, provided in both cases the consumer intends to sign the record as required by the E-Sign Act. The CFPB guidance follows common sense and tracks consumer expectations: if a consumer consents verbally to recurring payments, and the debt collector records and maintains that consent, the law is satisfied. Despite the clear CFPB directive allowing verbal consent for recurring payments, consumer attorneys continue to bring lawsuits against debt collectors asserting that verbal consent violates the law. In the absence of guidance from a Court of Appeals on the issue, the lawsuits against debt collectors – with uncertain outcomes in the Courts -- will continue. Further, these lawsuits undermine the ability of both consumers and debt collectors to rely upon interpretations of the law from the CFPB. In this episode of the Debt Collection Drill podcast, Moss & Barnett attorneys John Rossman http://www.lawmoss.com/john-rossman/ and Mike Poncin http://www.lawmoss.com/michael-s-poncin/ are joined by special guest Mike Etmund http://www.lawmoss.com/michael-t-etmund/ to discuss a recent case addressing whether verbal authorization for recurring payments is sufficient. Also discussed in this episode are newer cases on the Spokeo requirement that a Plaintiff must suffer a “concrete injury in fact” to maintain an FDCPA case and the status of the CFPB arbitration rule. Collection letters are the bane of our industry. Letters are expensive to send and - despite what a certain television pundit claims - studies prove that few consumers actually read collection letters. The CFPB, the FCC and other regulators pay little more than lip service to the urgent requests from consumer advocates to allow collectors communicate with consumers electronically, with States such as New York enacting Byzantine and unworkable rules to "allow" collectors to communicate with consumers via email. It is anticipated that the CFPB, in its upcoming notice of proposed debt collection communication rules, will adopt standards for electronic communications similar to the convoluted rules found in New York. Ultimately it is consumers that are harmed by these rules that disregard modern electronic communications in favor of antiquated collection letters. Further, consumer attorneys scrutinize collection letters, measuring the font size of disclosures and injecting tortured interpretations of plain language to find possible lawsuits (and potential paydays) against collection agencies diligently seeking to comply with the law. In the latest episode of the Debt Collection Drill podcast, Moss & Barnett attorneys John Rossman http://www.lawmoss.com/john-rossman/ and Mike Poncin http://www.lawmoss.com/michael-s-poncin/ discuss a new wave of lawsuits against debt collectors in California, which focus on the font size of certain disclosures, and New York, which centers on a misreading of Second Circuit case law. First party and early-out servicing provides an enhanced customer service experience and greater responsiveness for consumers. These qualities make first party and early-out servicing beneficial for creditors as well as consumers. However, as the prevalence of this type of servicing increases, consumer attorneys and regulators seek to find ways to apply traditional debt collection laws and statutes to first party and early-out servicing. The use of “scripts” by consumers to bait telephone debt collectors into alleged FDCPA violations is a calculated strategy dating back more than 10 years. Typically a consumer obtains such a script from a consumer attorney or from a website. The consumer will then make an inbound call to a debt collector and read certain questions off of the script, seeking to maneuver the debt collector to make a statement that facially violates the FDCPA. These scripts usually include vague, leading questions about interest or credit reporting. If the debt collector takes the bait; and makes an unintended mistake, a consumer attorney will sue or send a demand letter to the collection agency shortly after the call. Most collection agencies have in place specific training for collectors to identify and avoid such baiting, focusing on the common scripts and the certain States or geographic areas where such baiting most often occurs. In the latest episode of The Debt Collection Drill, Attorneys John Rossman (http://www.lawmoss.com/john-rossman) and Mike Poncin (http://www.lawmoss.com/michael-s-poncin) discuss a new baiting strategy by consumers that is resulting in a substantial number of claims and specific strategies for avoiding liability. The issue of debt collectors assessing interest on accounts was contentious and extensively litigated over the past decade. Courts, regulators and consumer advocates are uniformly opposed to debt collectors assessing interest except in specific circumstances. The Second Circuit Court of Appeals decision in Avila in 2016 further placed a requirement on debt collectors to disclose in a validation notice when interest is accruing on an account, similar to the requirements in the Seventh Circuit. Avila was not, however, the end of the discussion on disclosing that interest is accruing on an account; rather, it was the beginning a new line of cases. Consumer attorneys are now filing and threatening dozens cases (mostly in New York) asserting that if interest is not accruing on an account, the debt collector must disclose that interest is not accruing. Presently there are two reported decisions holding that a debt collector is not required to disclose when interest is not accruing and more decisions are pending. In the latest episode of the Debt Collection Drill podcast, Attorneys John Rossman (http://www.lawmoss.com/john-rossman/) and Mike Poncin (http://www.lawmoss.com/michael-s-poncin/) are joined by Attorney Dave Cherner (http://www.lawmoss.com/david-d-cherner/) to discuss this recent spate of lawsuits and strategies for avoiding liability. The attorneys also discuss the recent addition of Mr. Cherner to the Moss & Barnett team and options for agencies to outsource their chief compliance officer needs. Debt collection is clearly one of the most heavily regulated industries in the United States. Federal, State and local regulators place onerous, duplicative and often confusing requirements on companies seeking to collect debts. Further, when collection agencies comply with the myriad of laws, many face lawsuits from consumer attorneys claiming that the attempts at compliance somehow violate the law. In the this episode of the Debt Collection Drill, Attorney John Rossman and Mike Poncin discuss two recent, reported decisions where one collection agency – Financial Recovery Services, Inc. -- successfully defeated claims that its plain compliance with State and Federal regulations somehow violated the FDCPA. Financial Recovery Services was delighted to obtain the successful decision on the motion to dismiss in the Everett case in the Southern District of Indiana. Over the years, we have grown weary of the frivolous nature of such cases and we decided to take a stand several years ago and fight more of these ridiculous cases that are brought against our industry. Too often these cases are driven by the aggressive pursuit of consumer plaintiff attorney’s fees and not by what is fair, reasonable, and just for society in general. In the past several years, we have successfully disposed of over 23% of cases filed against us by either winning them with motions to dismiss or motions for summary judgment. We are proud to have taken a stand for everyone in the industry and we hope that we see more organizations take a stand against the frivolous nature of some of these types of cases. Should Debt Collectors Email Consumers? The issue of whether debt collectors may email consumers is finally being given serious consideration by regulators. A prescient article written by Rozanne Andersen in 2011 is the most comprehensive document on the topic of debt collection emails. New York regulators took the next step toward opening up email to debt collection communication with the rules it published in 2015. Earlier this year, the CFPB addressed the use of email for debt collection communications in several places in its Outline of Proposed Rules. On July 28, 2016, the CFPB released an outline of its proposed rules regarding debt collection. The outline is the next step in the first ever rulemaking in the nearly 40 year history of the FDCPA. Attorneys John Rossman and Mike Poncin examine some of the highlights of the CFPB rulemaking outline in the latest episode of the Debt Collection Drill podcast. Debt collection letters continue provide an expansive target for FDCPA and related lawsuits due to the panoply of Federal and State disclosure requirements for such letters. Further, the Court cases interpreting these requirements are in constant flux and new decisions sometimes contradict previous rulings. In a rare win for the collection industry, a recent case out of the Eastern District of New York -In Re Krieger- rejected a consumer's FDCPA claims brought in a putative class action and premised on language included in a collection letter. In the latest episode of the Debt Collection Drill podcast, attorneys John Rossman and Mike Poncin discuss the Krieger decision and provide specific collection letter recommendations for debt collectors, emphasizing the need for collection letters to be reviewed by an independent attorney on an annual basis. Do Consumers Need to Show "Concrete" Injury to Sue Debt Collectors? The Supreme Court decision in Spokeo v. Robins was expected to provide clarity to debt industry defendants facing FDCPA and related consumer lawsuits where the Plaintiffs’ allege no actual harm. Unfortunately, the case did little to specify exactly what type of “concrete” harm a consumer must allege to pursue a claim, but did provide some excellent language that can be used to refute consumer lawsuits where no actual harm is or could be alleged. In this episode of the Debt Collection Drill podcast, attorneys John Rossman and Mike Poncin focus on the Supreme Court ruling in Spokeo and how it may (or may not) help in defeating the seemingly never ending FDCPA and related lawsuits alleging violations of the law where no consumer is harmed. Debt collectors and consumer advocates agree that collection letters do little (if anything) to truly inform consumers about their indebtedness. Very few consumers actually read collection letters. Further, the verbiage that debt collectors are required by law to include in each collection letter is so voluminous, confusing and often contradictory, any truly meaningful information is often obscured by the required verbiage. The requirements for what debt collectors are required to provide in “snail mail” notices to consumers arises from a patchwork of Federal, State and local laws -- as well as case law that often varies by jurisdiction -- and many of the requirements are antiquated, dating back to the 1970s. Unfortunately, these dated and contradictory collection letter requirements continue to result in lawsuits and adverse Court decisions against debt collectors. The interpretation of certain provisions of the FDCPA by consumer attorneys, Courts and regulators contain a number of "Catch-22" scenarios where a debt collector is potentially subject to lawsuits and regulatory actions regardless of what the collector does. The latest iteration of this conundrum for debt collectors involves the disclosure of the tax consequences to a consumer for settling a collection account for less than the full balance. Debt collectors are required by a number of financial institutions to include these so-called "1099C" disclosures in debt collection communications. Unfortunately, the inclusion of these disclosures regarding tax consequences results in lawsuits against debt collectors. Perhaps most frustrating for debt collectors is that such disclosures are truly intended to assist the consumer, yet are misconstrued as efforts to deceive or confuse. 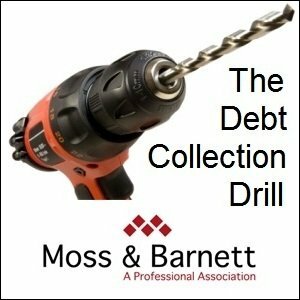 In this episode of the Debt Collection Drill audio blog, Moss & Barnett attorneys John Rossman and Mike Poncin examine the case law regarding "1099C" tax consequence disclosures by debt collectors and provide practical advice for navigating these difficult issues with creditor clients while complying with the law. In this episode of the Debt Collection Drill podcast, attorneys John Rossman and Mike Poncin discuss the recent challenges with volume form requests for validation and discuss strategies for responding in accordance with the FDCPA, along with the nuances of New York and Texas law that may affect how agencies respond. The beginning of the year presents an opportunity for debt collectors to assess the status of our industry and determine what changes each company can make to address the most pressing challenges. In this episode of the Debt Collection Drill podcast, attorneys John Rossman and Mike Poncin identify challenges arising from industry regulators and from the Courts while providing specific guidance on how best to avoid difficulties. Regulators from the CFPB and the FTC encourage the debt industry to look at past enforcement actions and other publications to determine what issues are most important to those agencies. A review of the recent enforcement actions by the CFPB and FTC, as well as other publications, reveal three distinct trends: actions involving unfair treatment of service members; the failure of debt collectors to adequately distinguish and investigate FDCPA and FCRA disputes; and, racial bias in debt collection efforts. In this timely and thought-provoking episode of the Debt Collection Drill, attorneys John Rossman and Mike Poncin discuss best practices for complying with collections involving service members, handling of FDCPA and FCRA disputes and tips for creating a program to assess and eliminate any racial bias in the debt collection process. During the podcast, the below article series on racial bias in debt collection is discussed. State legislatures frequently tweak debt collection laws, sometimes annually. These changes in the law often require changes to debt collection letters and processes by the debt industry. This year was marked by a number of legislatures making wholesale changes to the debt collection laws of their respective States. Three States in particular; New York, Illinois and Maine; changed their laws to such a degree that ambiguities exist in how to comply and questions have arisen as to whether complying with the new State laws will violate the FDCPA. In the latest episode of the Debt Collection Drill, attorneys John Rossman and Mike Poncin break down the law changes in these three States and provide practical guidance for compliance and avoiding pitfalls. WHAT DEBT COLLECTORS REALLY NEED TO KNOW ABOUT THE FCC ORDER AND THE TCPA. The recent order issued by the Federal Communications Commission (FCC) regarding the Telephone Consumer Protection Act (TCPA) encompasses 138 pages (including hundreds of footnotes) and created an instant tidal wave of questions, comments and uncertainty about the use of telephone technology to contact consumers on mobile phones. Attorneys John Rossman and Mike Poncin break down the FCC Order and the important highlights of it for the debt industry in 13 minutes in the latest episode of The Debt Collection Drill. There is a cost associated with a business accepting payments via credit card. Depending on the type of credit card, bank and payment processor used by the business, that cost can vary for each transaction. However, most consumers expect and demand that businesses will accept credit cards as a payment method. For the collection industry, whose members often accept a volume of payments, the fees associated with accepting credit card payments from consumers can be a substantial sum of money every month. Recent litigation and changes to the law regarding the ability of collection agencies to assess credit card convenience fees raises numerous questions. In the latest episode of the Debt Collection Drill, attorneys John Rossman and Mike Poncin tackle the issue of credit card convenience fees and the rapidly evolving law that governs such fees. Crucial Collection Law Update: Common Sense Prevails in West Virginia? The West Virginia Consumer Credit Protection Act, and how it was interpreted by the consumer attorneys in West Virginia, was the primary reason that State had previously been described as one of the most treacherous places in the country for debt collectors. Lawsuits were routinely commenced West Virginia State Courts seeking hundreds of thousands of dollars in statutory damages when the consumer suffered no injury. In this most recent episode of the Debt Collection Drill audio blog, attorneys John Rossman and Mike Poncin examine in detail the recent common sense changes to the law in West Virginia and how these changes will impact the debt industry. HAS YOUR COMPANY BEEN HIT WITH MULTIPLE FDCPA OR TCPA CLAIMS? Collection agencies, debt buyers and credit granters are often under siege, forced to defend against identical claims on multiple jurisdictional fronts, regardless of whether the claims are on behalf of an individual or a putative class. One strategy for consolidating the defense of identical claims is to file a motion with the U.S. Judicial Panel on MDL to transfer claims to a single venue. The MDL Panel was created under 28 USC 1407 and its job is to consider whether litigation pending in multiple federal courts involves common questions of fact that make it appropriate to consolidate and coordinate proceedings. The primary purpose of MDL is to centralize litigation to avoid duplicative and costly discovery, conserve resources and prevent inconsistent court rulings. In the latest episode of the Debt Collection Drill Moss & Barnett attorneys Mike Poncin and Issa Moe discuss the potential application of MDL to consumer litigation, the procedure for seeking MDL, and the risks/benefits associated with MDL. COURT EXPANDS “LEAST SOPHISTICATED” STANDARD TO INCLUDE ATTORNEYS? The concept that a debt collection communication must be viewed through the lens of the least sophisticated consumer is a fairly established tenet of FDCPA law. While the application of this standard is often the subject of litigation, its premise is that a debt collection communication violates the FDCPA if it would deceive or confuse the least sophisticated consumer. The obvious exception to the least sophisticated consumer standard is collection communications with a consumer attorney. This exception is recognized by a number of Courts including the 7 Circuit Court of Appeals decision in Evory which hold that assessing whether collection communications with an attorney for a consumer are deceptive will generally be judged using the competent attorney standard. The 11th Circuit Court of Appeals recently broke new ground on the assessment of collection communications with attorneys in the Crawford decision, holding that statements in a proof of claim filed in a Chapter 13 Bankruptcy are subject to the least-sophisticated consumer standard. While the ruling in the Crawford case is most notable and challenging due to its interpretation of the intersection between Bankruptcy law and the FDCPA, the implications regarding all collection communications with consumer attorneys is also substantial. Debt Collection Drill audio blog, attorney John Rossman hosts a discussion with Moss & Barnett attorney Sarah Doerr about the impact of Crawford decision not only on bankruptcy proofs of claim, but also all collection communications with consumer attorneys. Is There a “Silver Bullet” for Defeating FDCPA and TCPA Claims? Collection agencies and debt buyers continue to be inundated with FDCPA and TCPA lawsuits, many of which drag on through months and even years of expensive discovery and motion practice. What if there existed a single argument that could be made in many consumer cases that would successfully remove the matter from Court and likely end the case in its entirety? Surprisingly, such an argument exists, though it is often overlooked in the defense of debt collectors and debt buyers. A broad array of consumer contracts include arbitration clauses requiring that certain consumer disputes be resolved through arbitration rather than Court proceedings. Recent United States Supreme Court precedent supports enforcement of such arbitration clauses. Depending on the exact wording of the arbitration clause, motions to compel arbitration of FDCPA, TCPA and other consumer litigation may succeed where other arguments fail. Further, in a putative class action such as a TCPA class action if some of the purported class members are subject to an arbitration clause, this alone may be sufficient to defeat class certification. In the latest episode of the Debt Collection Drill, attorney John Rossman discusses a recent victory for a collection agency in a motion to compel arbitration, along with strategies for successfully crafting this argument, with special guest attorney Jim Bedell from Moss & Barnett. The New York State Department of Financial Services announced recently revised debt collection regulations, culminating more than a year of proposals and comments. While the new regulations provide clarity and consumer protection in some areas, they are fraught with ambiguities and overlap existing laws in several key aspects. Attorney John Rossman and Mike Poncin examine some of the more salient difficulties with the revised New York debt regulations in the current episode of the Debt Collection Drill. Defend Claims That Your Envelopes Violate the FDCPA! Using any language or symbol, other than the debt collector's address, on any envelope when communicating with a consumer by use of the mails or by telegram, except that a debt collector may use his business name if such name does not indicate that he is in the debt collection business. Since the Douglass ruling, filings of similar cases against debt collectors have been brisk, especially in Pennsylvania and New York. In the latest episode of the Debt Collection Drill, attorneys John Rossman and Mike Poncin discuss the Douglass decision and some specific legal theories upon which debt collectors may defend similar claims. NEW FDCPA REQUIREMENT FOR DEBT VERIFICATION: IS THERE MORE TO THE STORY? This provision will eliminate the recurring problem of debt collectors dunning the wrong person or attempting to collect debts which the consumer has already paid. A recent Sixth Circuit Court of Appeals Case, Haddad v. Alexander, Zelmanski, Danner & Fioritto, PLLC, examined the issue of what constitutes adequate verification in the context of multiple requests for validation by the consumer focused on a specific portion of a debt. While it has been argued that the Haddad case requires a debt collector to provide itemized statements whenever any request for validation is received, this interpretation is not borne out by a careful reading of the case and other applicable precedent. Attorney John Rossman and Mike Poncin examine the practical implications of Haddad and provide specific information necessary for debt collectors to respond to requests for validation in the latest episode of The Debt Collection Drill podcast. Can Debt Collectors Legally Charge Interest? Numerous recent FDCPA lawsuits challenge the ability of debt collectors to assess interest to accounts. These cases focus on a number of factors including whether collection letters need to disclose the accrual of interest and also interest on purchased accounts. Most recently, a California Court held that interest could only be assessed in certain circumstances after a judgment had been entered. In this recent episode of the Debt Collection Drill podcast, Attorneys John Rossman and Mike Poncin tackle the intricate issues involved with collection agencies assessing interest and provide an assessment of strategies to comply with the law. The CFPB recently began a more aggressive approach to the debt industry, bypassing the larger market participant examination process and issuing Civil Investigative Demands (CIDs) to a number of debt collectors directed at specific complaints and alleged practices. In a special episode of the Debt Collection Drill, John Rossman hosts special guest, attorney Mark Peterson. Mr. Peterson is a shareholder with Moss & Barnett, P.A. and has experience in assisting members of the debt industry in responding to CIDs. During the podcast, Mr. Rossman and Mr. Peterson explain the CID process, what a company should expect when a CID is received-including the cost of defending and the difficulties with a CFPB hearing. In this episode of the Debt Collection Drill, attorneys John Rossman and Mike Poncin discuss specific tactics to avoid issues involving CFPB complaints, leaving messages and concerns regarding the TCPA. Most FDCPA lawsuits are resolved without a Court ruling on the merits. Further, debt collectors win a surprising number of these out-of-Court resolutions, obtaining dismissals of the cases without paying anything to settle. In this episode of the Debt Collection Drill, Attorneys John Rossman and Mike Poncin discuss specific strategies debt collectors use to prevail without going to Court including public records investigations of the Plaintiff, negotiations with opposing counsel and examining the actions of the Plaintiff during the debt collection process. If your agency has begrudgingly paid to settle a questionable FDCPA case in the past year, this is an episode you will not want to miss. Most consumers advocates and collectors agree that the validation language contained in the FDCP A is stilted and obscure. However, the validation notice is a foundational document of the debt collection process. Two recent Court of Appeals cases examined questions about the wording of specific validation notices and have caused concern for collectors about the language used. Attorneys John Rossman and Mike Poncin examine these recent rulings in the latest episode of the Debt Collection Drill and provide tips and language to use for validation notices. Two substantial debt collector victories in FDCPA cases at the end of 2013 – both of which were won by Moss & Barnett attorneys – may set the tone for many lawsuits in 2014, especially as they relate to the "least sophisticated consumer" standard. In both cases, Courts rejected claims by the consumers and found that the collection agency had acted within the scope of the law. Attorneys John Rossman and Mike Poncin discuss these recent cases and the impact they will have on every collection agency during their most recent episode of the Debt Collection Drill. Debt collectors will long remember 2013 as a watershed year for the regulation of our industry. The CFPB issued its Advance Notice of Proposed Rulemaking while continuing on-site examinations of debt collector larger market participants, enforcement actions and publishing data from its complaint portal. The FTC issued a record fine against a debt collector and joined the CFPB in several important amicus briefs submitted in pending FDCPA cases. Numerous States also tightened regulation on the debt industry. All of this regulation of the debt industry is apparently aimed at aiding consumers. However, a recent study published by the Federal Reserve Bank of Philadelphia empirically established that stricter debt laws actually harm consumers by reducing their access to credit. In this episode of The Debt Collection Drill attorneys John Rossman and Mike Poncin discuss this Federal Reserve Bank study from May 2013 and its impact on future regulation of the debt industry. A link to the study is below. The Consumer Financial Protection Bureau is moving forward with plans to overhaul the FDCPA, focusing specifically on debt documentation, call frequency and modernizing the law to account for technology changes since the FDCPA was enacted in 1977. In this episode of The Debt Collection Drill, attorneys John Rossman and Mike Poncin discuss the CFPB’s recent Advance Notice of Proposed Rulemaking and identify three areas of potential change for the industry. "Precollect" Causes FDCPA Heartburn for Collectors and Creditors! Creditors seeking to reduce collection costs often ask collection agencies for "precollect" efforts at a discount from normal contingent fee rates. Some collection agencies provide lettering services – with all calls and payments directed to the creditor – at a flat rate per letter or account. Unfortunately, the FDCPA prohibits such flat fee arrangements in some circumstances. Further, consumer attorneys are aggressively pursuing FDCPA lawsuits against debt collectors and their clients for precollect "flat-rating," which often drives a wedge because the debt collector and its client. In the latest episode of The Debt Collection Drill, attorneys John Rossman and Mike Poncin discuss the recent surge in precollect "flat-rating" cases against collectors and creditors and also reveal some strategies for avoiding these claims. Consent orders earlier this year by the FTC regarding credit card surcharges (convenience fees) and voice mail messaging indicate an willingness by Federal regulators to allow these practices, but provide little guidance for the industry. Attorneys John Rossman and Mike Poncin examine the recent rulings the CFPB and FTC – and the possibly implications of CFPB rulemaking – in the latest episode of The Debt Collection Drill. Lawsuits alleging that debt collection letters violate the FDCPA decreased over the past few years as consumer attorneys focused litigation on Foti and TCPA claims. Recently, letter violation lawsuits spiked with novel claims that are gaining traction in some Courts. Attorneys John Rossman and Mike Poncin discuss three new letter violation claims that are being used to challenge collection letters across the country in the latest episode of The Debt Collection Drill. The FTC Thinks Foti Message Violates the FDCPA... Now What?! Last week, a $3.2 million consent order between the FTC and a major debt collector shook collection industry to its core. Not only was the amount of the fine unprecedented, but the subsequent restrictions placed on the debt collector by the FTC have broad implications. Importantly, the consent order apparently prohibits the use of the widely accepted Foti phone message in certain circumstances and also requires debt collectors to honor verbal cease requests and disputes. Attorneys John Rossman and Mike Poncin break down the consent order and offer ideas for future compliance during the latest episode of The Debt Collection Drill. Your agency likely spends significant time formulating and refining a service-oriented and FDCPA compliant process for responding to consumer disputes. Recently, collection agencies face lawsuits and regulatory questions arising from state laws that impose dispute response burdens substantially in excess of the FDCPA. Attorney John Rossman and Mike Poncin discuss compliance with these state laws in the current episode of The Debt Collection Drill. Debt Collectors Face Six Figure Fines in New York City: Is Your Agency Next? In this episode of The Debt Collection Drill audio blog, attorneys John Rossman and Mike Poncin discuss recent actions by the New York City Department of Consumer Affairs seeking six figure fines from debt collectors for failure to comply with New York City laws and some simple steps all agencies can take to avoid liability. Is Every Collection Call a Violation of the Law? In this episode of The Debt Collection Drill, attorneys John Rossman and Mike Poncin examine three recent court decisions that, if up held, will severely restrict the ability of debt collectors to call consumers. They also discuss some practical strategies for debt collectors to make calls while complying with the law. Debt Collectors Gone Wild? What the Media Doesn't Know. In this episode of The Debt Collection Drill, attorney's John Rossman and Mike Poncin discuss recent media "horror stories" about criminals posing as debt collectors and provide a simple and effective solution for every industry to improve its mistaken image. In this episode of The Debt Collection Drill podcast series, attorneys John Rossman and Mike Poncin examine the real difficulties with obtaining sanctions in FDCPA cases and discuss specific scenarios where sanctions motions may be warrented. In this latest episode of the Debt Collection Drill, attorneys John Rossman and Mike Poncin discuss strategies for avoiding TCPA lawsuits including issues involving consent, the definition of an automated dialing machine and wrong number calls. In this episode of the Debt Collection Drill, attorneys John Rossman and Mike Poncin discuss specific ways debt collectors can take to avoid costly mistakes in 2013 including steps to prepare for CFPB supervision, the appropriate way to accepts checks by phone (hint: many companies may be doing it incorrectly) and little known licensing issues causing class action headaches. Do Consumers Really "Trick" Debt Collectors into FDCPA Lawsuits? In this episode of the Debt Collection Drill audio blog, attorneys John Rossman and Mike Poncin discuss how certain consumer questions to debt collectors frequently result in FDCPA lawsuits and how to respond to those specific questions. In this episode, Attorneys John Rossman and Mike Poncin discuss specific strategies for preventing and defeating FDCPA claims including collection call recordings, researching the background of FDCPA Plaintiffs, leveraging relationships with opposing counsel and fighting the good fight. Debt Collectors Prevail in Recent FDCPA Cases -- Is the Tide Finally Turning? In this episode of The Debt Collection Drill, attorneys John Rossman and Mike Poncin discuss a recent trifecta of FDCPA victories by Moss & Barnett, P.A. for debt collectors and the impact of these cases on the debt industry. Welcome back to this episode of The Debt Collection Drill. Today Moss & Barnett shareholders John Rossman and Mike Poncin are discussing State Laws that Prohibit Debt Collection Tactics. August 4, 2012: Should I Go to Law School? In this episode of the Debt Collection Drill audio blog series, attorneys John Rossman and Mike Poncin discuss recent Court rulings in which judges dismissed FDCPA claims that lacked common sense. The attorneys also provide specific tips for using common sense to avoid and defend against FDCPA lawsuit. Are Debt Collector Phone Messages Illegal? In this episode of the Debt Collection Drill podcast, attorneys John Rossman and Mike Poncin examine a recent trifecta of debt collector court victories that reshaped the landscape for debt collector phone messages. Also mentioned during the podcast is the upcoming May 17, 2012, FDCPA compliance webinar sponsored by Ontario Systems and featuring attorneys Rozanne Andersen and John Rossman. In this much anticipated episode of the Debt Collection Drill podcast, attorneys John Rossman and Mike Poncin examine the role the Consumer Financial Protection Bureau will play in supervising the debt industry and they provide specific information for preparing for CFPB audits and oversight. The Most Treacherous Place for Debt Collectors in the U.S.A. In this episode of The Debt Collection Drill, attorneys John Rossman and Mike Poncin identify dangers associated with collecting in certain states and provide specific strategies for avoiding costly litigation. Is it Illegal to Record Collection Calls? In this episode of The Debt Collection Drill audio blog, attorneys John Rossman and Mike Poncin examine the state laws and recent cases, including class actions, involving the recording of calls. In this episode of The Debt Collection Drill, Moss & Barnett attorneys John Rossman and Mike Poncin offer crisis response strategies for collection agencies facing batch letter errors, inquiries from the media and employee misconduct. In this episode of The Debt Collection Drill, Moss & Barnett attorneys John Rossman and Mike Poncin explore the top reasons why consumers sue debt collectors and provide guidance for collection agencies to avoid being targeted by lawsuits. Moss & Barnett Shareholder John Rossman appeared on the October 8, 2011 episode of Minnesota Law, and discussed an article in the Star Tribune about the Minnesota Department of Commerce issuing fines to collection agencies for employing criminals to work as debt collectors. In this episode of The Debt Collection Drill, Moss & Barnett attorneys John Rossman and Mike Poncin discuss the two most important cases from 2011 that impact every debt collector. Their topics for this episode include common collection letter language that a recent court ruled violated the FDCPA and also a case that clarified the permissible purposes for a debt collector to review a credit bureau report. In this episode of The Debt Collection Drill, Moss & Barnett attorneys John Rossman and Mike Poncin discuss three crucial issues that every debt collector should know – but likely does not know -- about FDCPA class actions. Their topics include use of net worth of the debt collector as a defense, the applicability of contractual arbitration clauses and the qualifications of an individual plaintiff to be a class representative. In this episode of The Debt Collection Drill, Moss & Barnett attorneys John Rossman and Mike Poncin discuss solutions for collection agencies leaving phone messages including the commonly used “there will be a five second pause” workaround message, issues with alleged third party disclosures, possible messaging premised on the FDCPA skiptracing provisions and new developments regarding bona fide error and the eavesdropping/consent defenses. In this bonus episode of The Debt Collection Drill, Steve Thomson hosted John Rossman on June 18, 2011 on Minnesota Law presented by Moss & Barnett on WCCO Radio. The topic was “Savvy Social Media and the Law”. Episode 6: Can a Debt Collector Legally Use Facebook, Text Messages or Email to Collect a Debt? In this episode of The Debt Collection Drill, attorneys John Rossman and Mike Poncin examine the legality of using Facebook and text messages to collect debts and also discuss obtaining consumer consent before using email to communicate with a consumer. In this episode of The Debt Collection Drill, attorneys John Rossman and Mike Poncin examine recent court decisions that reject FDCPA claims due to no evidence of damages or materiality. In this episode of The Debt Collection Drill, attorney Michael Poncin leads an informative discussion with attorney John Rossman on recent case law developments and compliance strategies regarding the TCPA. In the third installment of The Debt Collection Drill, Moss & Barnett Shareholders John Rossman and Michael Poncin discuss debt collectors’ biggest mistakes regarding State licensing violations. Episode 2: Collection Harassment: How many calls is too many? Episode 2 of the monthly podcast series The Debt Collection Drill focuses on multiple collection calls and is titled “Debt Collection Harassment: How Many Calls is Too Many?” Each podcast in this series runs less than 10 minutes in length and features Moss & Barnett attorneys John Rossman and Michael Poncin providing sage tips for improving collections and compliance. In the premiere episode of "The Debt Collection Drill," Moss & Barnett shareholders John Rossman and Michael Poncin discuss specific strategies for individual phone collectors to avoid lawsuits.